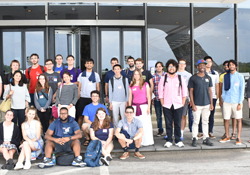 The DIMACS REU program combines many associated subprograms, which are administered together and run concurrently as a single program. The programs support interdisciplinary projects related to computer science and mathematics, and are mentored by Rutgers faculty. Project descriptions have included topics in computer science, mathematics, operations research, engineering, statistics, biology, chemistry, and physics. Located at Rutgers University, DIMACS facilitates research, education, and outreach in discrete mathematics, computer science theory, algorithms, mathematical and statistical methods, and their applications. Students must be U.S. citizens or permanent residents enrolled full time as an undergraduate at a U.S. institution to be eligible for funding. A select group of students will spend 2 weeks in Prague as part of the international component.